Halloween is one of the few 'holidays' I don't really get; it was never a part of my childhood, and while I enjoy a good seasonal ritual as much as anyone, Halloween in its modern form does nothing for me. I don't tend to enjoy ghost stories unless they involve the ghosts of Saxon archbishops or supremely spooky ballads ('The Wife of Usher's Well' and 'The Unquiet Grave' are my favourites.) However, I do make an exception for the ghosts of Old Norse literature, because they're just so awesome, and the stories have a certain dazzling glamour all of their own. And so (breaking all my own rules about not co-opting medieval literature for modern holidays) can I take this opportunity to interest you in an Old Norse ghost story anyway? Yes? Excellent. Anyway, that's not today's ghost story. This one appears in a text called Hervarar saga ok Heiðreks, and is the story of a fearless young woman who dresses up as a man and goes into her own father's burial-mound to retrieve the magical sword which was buried with him. She rouses her father's ghost, and they have a conversation in verse, and it's all deliciously eerie. The story begins with the magical sword, which is named Tyrfing. The saga tells us that Tyrfing was made by dwarves, and every time it was drawn a light shone from it that was like a ray of the sun. This sword could never be held unsheathed without causing the death of a man, and it always had to be sheathed with the blood still warm upon it. Whatever the sword wounded would certainly die, and the man who carried it in battle would always be victorious if he struck a blow with it. This sword belonged to a viking named Angantýr, who inherited it from his father; but he and his eleven brothers, all berserkers and warriors of great power and strength, were killed together in battle and buried in a mound on the island of Samsey. And then begins the story of Angantýr's daughter Hervör, born after her father's death, who grows up to be a warrior, Viking, and fearless grave-plunderer. The following is my rather loose translation of the saga, but a closer one can be found in The Saga of King Heidrek the Wise, trans. Christopher Tolkien (London, 1960), downloadable here. In the Old Norse almost all the dialogue is in verse, so it's set out like that here. [Angantýr's wife] was pregnant, and gave birth to a very beautiful girl. She was sprinkled with water and named Hervör. She was brought up by the jarl [her grandfather], and she had the strength of a man; as soon as she could do anything for herself she trained herself with the bow and shield and sword more than with sewing and weaving. She more often caused trouble than good, and when that was forbidden to her she ran away to the woods and attacked people to rob them. When the jarl heard about this highwayman he went with his men and seized Hervör and brought her home with him. After that she lived in his house for a while. It happened one day that Hervör was standing outside near a group of slaves, and she treated them badly, as she did everyone. Then one of them said to her, "All you ever want is to cause trouble, Hervör, and trouble's all that can be expected from you. The jarl forbids everyone from telling you about your parentage, because he's ashamed that you should know it - the lowest slave slept with his daughter, and you're their child." though my mother found favour with Fródmar. now I'm told he tended the pigs! your father was counted glorious among men. stands on Sámsey’s southern border. which I shall gain for myself, if I survive. a shirt and cloak be prepared for me. equip me in all ways as you would your son. I can have no rest here now. Who is coming all alone to the island? Quickly, go and find lodgings! Do not ask that; you are not wise! Friend of vikings, you are in danger. out in the open lies terror for men. though all the island be burning with flame. 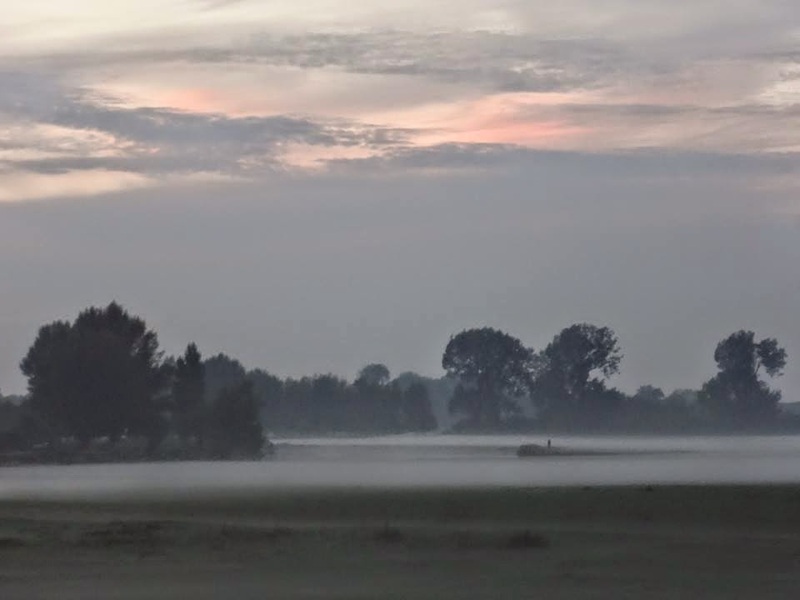 field and fen are burning – run faster! He ran off home to the farm, and so they parted. Now she saw where on the island the treasure-fires were burning, and she went in that direction without fear, though all the mounds stood in her path. She walked through the fires as if they were no more than mist, until she came to the berserkers' barrow-mound. Norse legend had it that ghostly treasure-fire burned inside and around burial-mounds, showing where gold was hidden. child of Sváfa, your only daughter! forged by the dwarves for Sigrlami. shield and war-gear and blood-stained spear. will speak to me in Munarvág. unless you fetch the sword which Dvalin forged! It is not fitting for ghosts to bear precious weapons. Hervör, daughter, why are you calling? You are going to a fate full of evils. wild in your wits; you awaken dead men! and only one wielded it after. You are not telling the truth! flee, girl, to your ships, if you can! though she see a ghost stand at the grave-door. will be the ruin of all your family. destroyer of shields, Hjálmar's bane. who would dare hold this sword in her hand. the sharp-edged sword, if I may obtain it. the flame grows less as I look at it. to rush into the fire with open eyes! young girl, I cannot refuse you. to give to me the sword from the barrow. than to hold all Norway beneath my hand. You are wretched in your words, miserable woman! how my sons may fare hereafter. Hjálmar's bane safe in the sheath. worse than evil and bringer of doom to men. the sons of Arngrím left behind them. May you all lie unharmed in the barrow! I am eager to be away. when all about me the grave-fires burned. Hervör went down to the shore, and when the dawn came she saw that the ships had gone; the vikings had taken fright when they heard the thunder and saw the fires on the island. 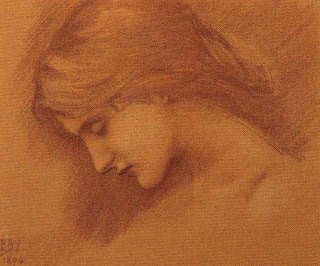 'There is no fire burning by night that can make me fear your corpse-flames; this girl's courage will not falter, though she see a ghost stand at the grave-door...' 'I seemed to myself to be set between worlds, when all about me the grave-fires burned...' Now there's a ghost story for you! The fearlessness of Hervör makes it somehow more eerie than if she were frightened; there's a sense that in her determination to pass beyond this world she has been transformed into something other than human, a creature even the ghost fears. Her willingness to curse the ghosts of her slain father and uncles if they won't give her the sword is... impressively dedicated. But it will not surprise you to learn that the ghost's prediction of disaster for Hervör and her sons comes to pass; you can read about what happens next here. Entering burial-mounds to gain their treasure is a fairly common motif in both Scandinavian and Anglo-Saxon literature (think of Beowulf); barrows and burial-mounds are features of the landscape which are both visible reminders of the dead and portals to another world, the abode of ghosts and dragons. As well as appearing in stories like Hervarar saga, they also feature in legends told about historical figures, including one which connects the terrifying Viking Ivar the Boneless to the Norman Conquest of England (which I wrote about here). 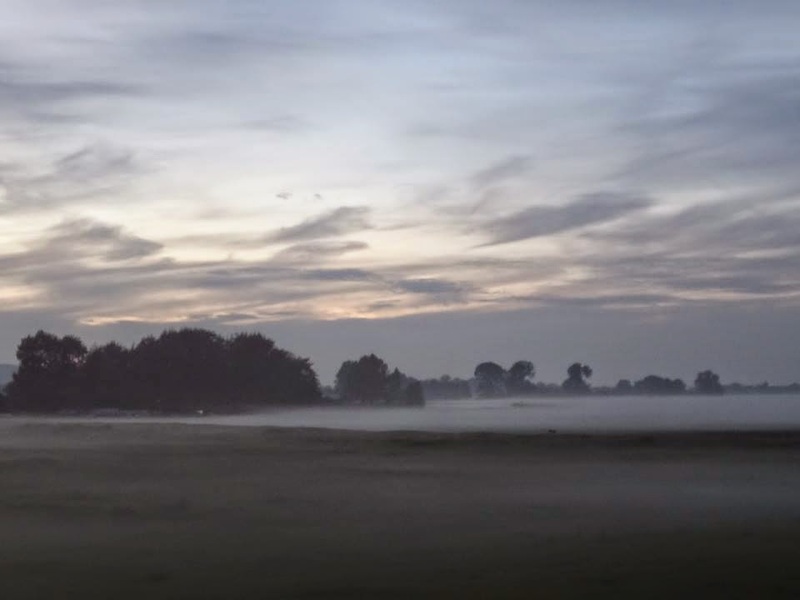 Inexplicably, few artists seem to have depicted the story of Hervör, so the illustrations in this post are Arthur Rackham's Brynhildr (another awakened inhabitant of a fiery earth-mound), and then mist after sunset on Oxford's own version of the Barrow-downs, Port Meadow. 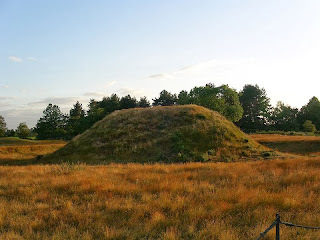 And finally, of course, one of the burial mounds at Sutton Hoo, which more than anywhere else I've ever been conveys the atmospheric power of this kind of landscape. Legend has it that the owner of the estate at Sutton Hoo decided to excavate the land after being told of a sighting of ghostly warriors riding around the mounds. That was in 1939; people have not stopped telling ghost stories about burial-mounds, or entering them in search of treasure. This morning I've been admiring the work of someone who is uploading the entirety of the Cloud of Unknowing on youtube - quite an undertaking! The text is Evelyn Underhill's 1922 'translation' of the Cloud, which is not really a translation at all - it's very close indeed to the Middle English (a strategy I thoroughly approve of). Find it here, and enjoy. 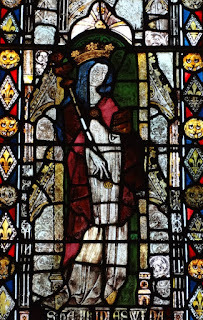 While we're on the subject of medieval mystics, I don't think I've yet linked here to my own reading of a short extract from Julian of Norwich - which is definitely in Middle English, or as close as I could manage... It's not brilliant, but somebody might find it interesting. 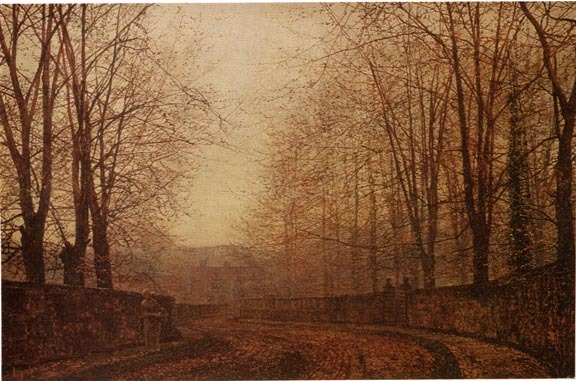 Robert Louis Stevenson, in autumnal mood. The year is like to die! That cloys the sullen days! Thee, heart of mine, I greet. Sink now thy weary feet? On thee, with evil face. I posted about Sam Lee's version of 'Puck's Song' a while ago, and you can now hear it on youtube here. Do read the Guardian article which accompanies the video, too, if only to be reminded of the tantalising strangeness of 'The Bitter Withy' - a folk song based on a medieval legend based on apocryphal gospels about the childhood of Christ (did you follow that? It's explained better here). Gypsy songs are close to my heart, because my father's father (whom I never met) was from a Romany family. He was born in a caravan in a field in Buckinghamshire, as all his family were, as far as I can trace; he settled down in a house for a while when he married my grandmother, but disappeared into the night when his youngest child was four years old, never to return. Thus, all I know about his family comes from my own research with birth certificates and census records - although they did their best to avoid such things! - rather than personal knowledge. I can't think very kindly of him for the way he left his wife and children, but nonetheless there's a part of me that yearns after all things gypsy, and wonders what in me would be different without that genetic strain. In almost every way my life couldn't be more different from my grandfather's: just about the only thing I know about his character is that although he was illiterate, he used to carry a newspaper around under his arm; and now here's me, a creature of books and libraries, essentially a professional reader. His family had been travelling around the Oxfordshire/Buckinghamshire countryside for generations - how bizarre it would have seemed to them that their grandchildren should be studying at Oxford University, not camping at the gates but inside the walls. The singer is Sheila Smith, a gypsy girl who was seven years old when this was recorded in 1952. It's just extraordinary. About her ways. Oh, now to know you sleep! Sleeping prevail in earth and air. Move gently round the room, and watch you there. Where your feet, your morning feet, shall tread. And still the darkness ebbs about your bed. Quiet, and strange, and loving-kind, you sleep. And holiness upon the deep. And there you have it - an explanation of the advantages of translation and a programme for the production of vernacular literature. To pay homage to Alfred I thought today I'd pay a visit to the town of Wantage, which is where he was born. It's not that far from Oxford, and I've never been before. In Alfred's time it was the site of a royal palace, and it stands near the ancient tracks of the Ridgeway and the Icknield Way, in the Vale of the White Horse. These paths and the white horse were ancient long before Alfred was born, or before he learned to memorise English poetry at his mother's knee. Open between 10.30 and 12.30! I could have cried; when you're standing in front of a locked door it starts to feel like a rather pointed metaphor. I took a picture of the sign because, well, there was nothing else to take a picture of, and its solidity infuriated me. When they were having this sign planned and professionally made, didn't it occur to anyone to say, 'you know, if you're not standing right outside the church door this information isn't available - maybe we should put it on our website...'? It's this kind of thing that makes me think churches don't really want to interact with the public, since they've given no thought to how strangers might first encounter them. (I've recently been doing some work writing the website of a small charity, so I've been thinking about these things). 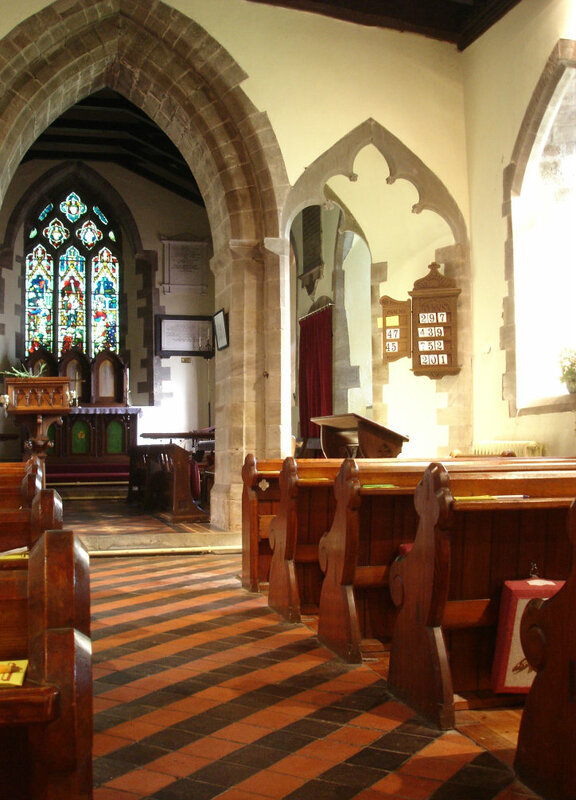 Of course churches can open and close at whatever hours they please, but what's the harm in providing clear and accurate information about the hours they're open? To do otherwise, when people might be travelling some distance to visit, is just thoughtless and inconsiderate. The churchyard was leafy and autumnal, but it was raining, so I didn't linger. It's pretty, but would have been prettier in the sunshine. 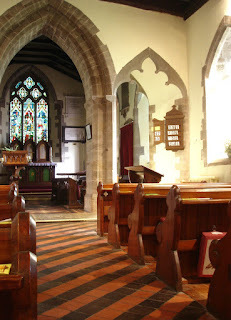 Experiences like this make me think I should really stop trying to write my own church-visiting posts, and become one of those blogs which just copies and pastes photos and text from Wikipedia; at least you can do that from the comfort of a warm, dry room! But, you know, there's a bigger statue of Alfred in Winchester and Winchester actually wants visitors, so if you're looking for Alfred-related destinations I suggest you go there instead. Alfred looks out over Wantage. Probably in disapproval. 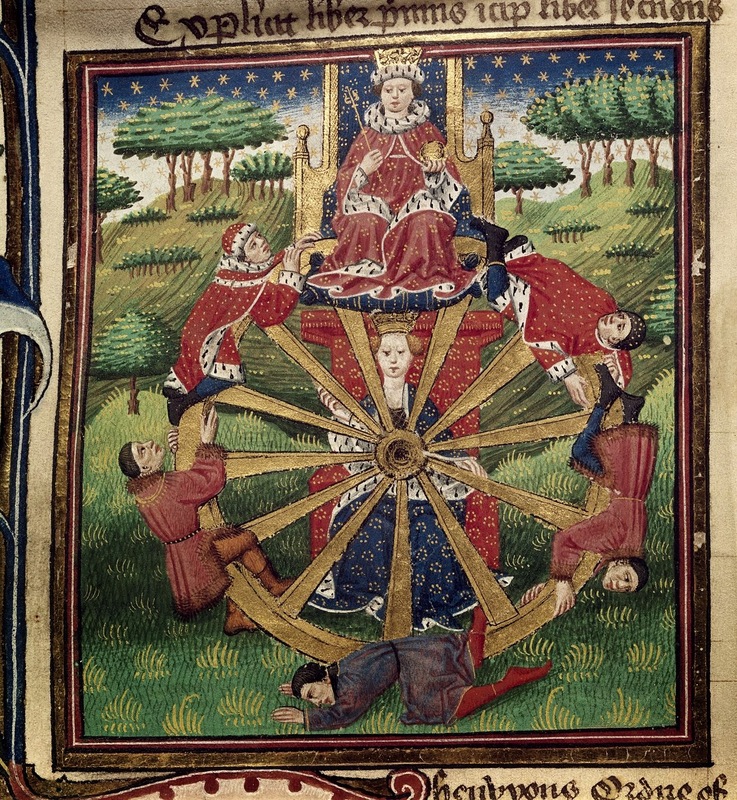 One of the most common google searches which brings people to this blog is 'medieval wheel of fortune', and they get this post, a fifteenth-century poem in which the lovelorn speaker begs Fortune to turn her famous wheel and let him/her have joy again. It's a good poem, but the appeal to Fortune is conventional and perhaps a little overly mannered; so I like to believe that it was out of irritation with this poetic conceit that the song in today's post was born. 'Forget about Fortune', says the singer, 'God is on my side!' It's meant to be a fairly cheerful sentiment, I think, and not as smug as that paraphrase makes it sound. The phrase 'Auxilium meum a Domino' means 'my help comes from the Lord' and occurs in a number of contexts, including for instance the second verse of this psalm. Fortune doth miss her will and liberty. Then trust to Virtue; let Fortune go! When she list, may call Fortune's chance again. What [care] I then, though Fortune be my foe? In youth, in age, in suceess and in sorrow, my help comes from the Lord. Though poets pretend that Fortune, by her use of chance and at her own will, forces people down and raises them up, Fortune misunderstands the extent of her power and freedom. So trust to Virtue; forget about Fortune! My help comes from the Lord. These ducks appear in the scene of Frideswide fleeing to Binsey. 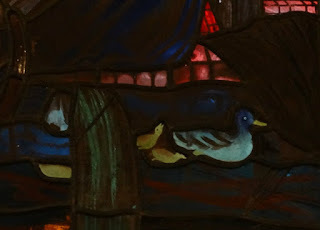 Above them, Frideswide is desperately clinging to a tree (or something; it was a bit too dark to tell), but the ducks pursue their merry way down the Thames. But now we rejoice that they rest in the Lord. Had girt them with grace for the way they should go. And still they were seeking the city of God. Where the clouds of earth’s sorrows are lifted at last. The words are by William Henry Draper (1855-1933), who also wrote this Lenten hymn. I wasn't entirely sure about it when I first saw the words, but they grew on me as I sang; verse 3 is particularly nice, and could not have been more appropriate within those walls. Of course the stones of today's Christ Church, though they have echoed Frideswide's praises for centuries, were never beheld by the eyes of the saint herself; but the ground she walked on can't be far away from the cathedral. I liked the last two lines of verse 2, as well; 'girt with grace' is a felicitious phrase, which had me pondering the verb to gird - the suggestion is of the ceremony by which a knight receives his sword before the altar, but also something more nebulous (literally) because to be girded is to be 'surrounded' by grace as if by a cloud of witnesses. 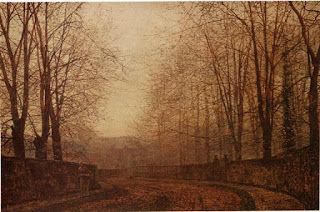 And I thought about a garth, etymologically related to the verb, a word which came from Old Norse into northern English: enclosed ground, 'a garden walled around', and the green space within a cloister which in Oxford we now call a quad, of which Christ Church has such a splendid example. 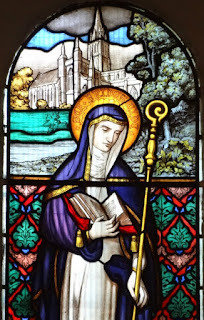 A girded garth can be a little garden or all the space of the known world, the Miðgarð in which we all live; that's the 'dear ground' St Frideswide trod. I've heard this anthem many times, and sung it not a few, but it moved me last night in a way it never has before. The choirboys were tremulous on their high notes, and sounded more than usually childish as they came in with 'and in all our dangers and necessities'; somehow this makes it all the more plaintive, as on our behalf they put forth a prayer they are too young to understand. The words (a collect from the Book of Common Prayer) are very simple; they ask for everything and nothing, for all one could wish a merciful God would do for people he loved, and all one ought not perhaps really to hope for. I can't decide how to finish this post or remember what the point of starting it was, but I hope you enjoyed the music, anyway. 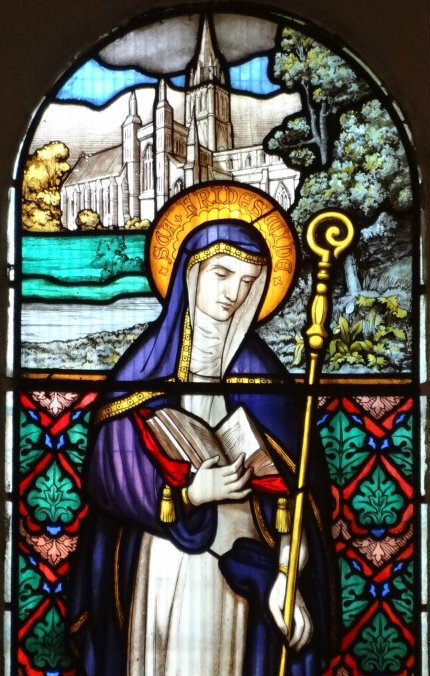 Today is the feast of another in the long line of Anglo-Saxon royal nun-saints: St Frideswide, who died on 19 October in the year 727. Frideswide is the patron of Oxford, both city and university, and her shrine is here in Christ Church Cathedral, which stands on the site of the medieval priory which bore her name. 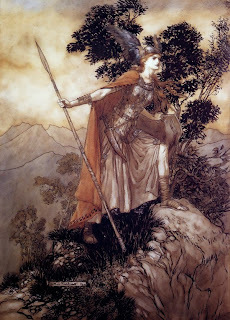 In outline her story is a familiar one: as legend has it, she was the daughter of a Mercian king, who chose the religious life but was sought in marriage by a wicked king named Algar; she fled his advances to a forest near Binsey, where she discovered the treacle-well, and was hidden there until Algar was killed by falling off his horse just outside the city gates and breaking his neck. There was a superstition in the Middle Ages which said that because of Algar's fate, no king had entered the city of Oxford from the time of Frideswide until Henry III defied the ban in 1263; this is not literally true, at least of the pre-Conquest kings, but I suppose it might be true of the post-Conquest ones (the royal palace of Beaumont, near where the Ashmolean now stands, was outside the city walls). This part of the legend is an interesting counterpart to the stories of Norman barons fleeing St Etheldreda, and Cnut being so afraid of St Edith; why, you might ask yourself, were such noblemen supposed to be at risk from the supernatural powers of these dead saintly women? Anyway, in honour of St Frideswide I thought I would post a Middle English verse account of her life. It comes from the same stable as the jolly little Middle English life of St Benedict which I posted in July; they're both from the 14th-century collection of vernacular saints' lives known as the South English Legendary. 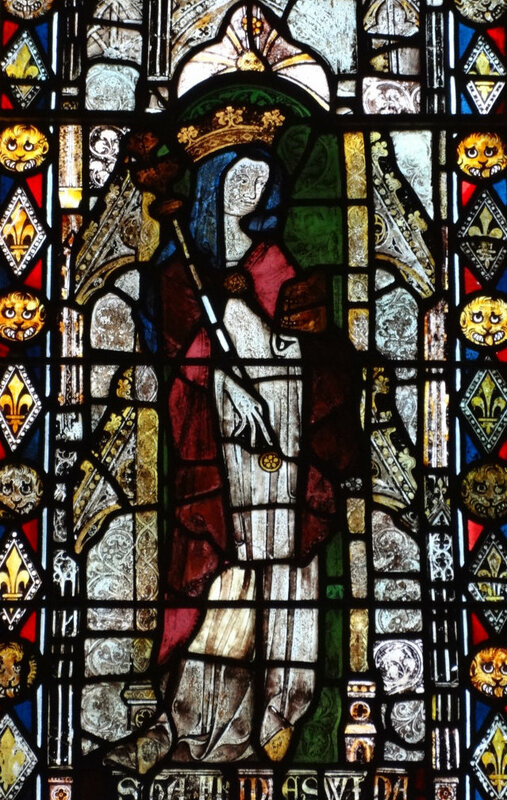 There are actually two versions of St Frideswide's life in that collection, and this is the shorter one (you can find the shorter one here and the longer one here). I must warn you in starting: from an artistic point of view, this poem really isn't very good. You won't hear me say that about most of the medieval texts I post here, because a) I only post things I think are good and b) I like to encourage people to see the best in medieval poems which are not generally thought to be worth much artistically; most of the short lyric poems I post here, for instance, are not considered the best of the genre, but I think they have a lot of merit and are sadly underrated by scholars. That is not the case with this Life of St Frideswide! It's not meant to be high art: it's a pacy, memorable tale, recounting the most important moments in Frideswide's life and not attempting to be particularly clever about it. But it is quite fun. To preserve that quality, I've put it into a modernised doggerel form below the ME text; the uneven metre and even some of the dodgy word order are also found in the original. Enjoy! Atte Oxenford heo was ybore, as ich understonde. This were hire eldren, that hure gotten hem bytwene. So wel heo spedde in six monnthes that heo hure Sauter couthe. Alle hii hadde joie of hure that couthen hure knowe. Of the hard here was hure nexte wede. And the cold welle water - that was hure drynke. Now wold a knyghtes doughter grete hoker of suche sondes thynke! In Seint Marie churche, that he hadde er bygonne. That bereth the nam now of that mayde that lyth yschryned ther. The king was glad of this chyld, that to clene lyf drowe. To maken his doughter nonne ne thoght hym no schame. And schar hure in the nonnerie with hire felawes twelve. And thoght myd som gynne of goud lyf hure lede. In goldbeten clothes that semed swythe ryche. "My derworth mayde," he sede, "ne thynke thee noght to longe. Tyme hit is for thy travayle that thou thy mede afonge. Ich am thulke that thou byst to: take now goud hede. Honoure me here, and for thy servyse ich croune thee to mede." Another he that mayde bede, yif heo hym honoury wolde. "Fare fram me, thou foule fende with thyn byheste!" Heo made the croys, and he fley awey with noyse and grete cheste. That hure fadere and hure modere both ded were. He was king at Oxenford ychose - a wonder luther man. He ofsende Fretheswyth, to habben hure to wyve. Heo sede heo was to God ywedded, to hold by hure lyve. If heo dude, wel heo wyste God wold be awreke. For gyfte other for anythyng, and thee His hyne take." And don the maide byfor the king anon to hym come. Bynome hem was the myght the mayde for to fynde! And thennes to the king passe that hii mosten habbe myght. Thannes hii wende, and al that cas hii toldyn the king. And swor that hure wocchecrafte scholde hure lyte helpe. And bad hire oute of the kinges syght wende, that was so grame. With somme that heo with hure toke - tweyne, witthoute mo. Ne dorste heo come at non toune, to dwelle at non holde. Thre wynter in an hole woned, that seylde me hure say. And thoght to do the mayde other than goud. And habbe this maide Fretheswythe with strengthe agenryght. That heo in the wode of Benysye preveliche yhydde was. For to enserchy after this mayde yf he myght cache. So that heo was underyute that heo was fleynde. After hure me wende faste; the king rod ernyng. The mayde scaped into the toune, as hit was Godes grace. And felle and brake the kinges necke; and that he gan awynne. Nas ther non of his men tho that derst come withinne. The maide holde hure ther in pes fram alle hure fon. Glad was that myght with hure speke other to hure gon. Into alle Englonde that me wyste nas yholde hure pere. Up a fyscher that in a bote with his felawes aslepe lay. He bygan to ravien as he awoke of slepe. And wan he was afalle, with his teth on hym he gnowe. And uneth with muche pyne hii teyghede hym and bonde. Toward that holy mayde, that heo for hym bede. The bounden body felle adoune, as hit were ded. And suth hym a Godes name hole and sounde to aryse. And that mayde that hym delyvered of that foule wyght. As heo yede a day in the toune, a mysel heo mette. And bysoght that lady that heo hym cusse scholde. Heo custe hym, and he was hole, ryght as God hit wolde. And suth after hure deth; hii neren noght yhud. Heo wend out of this world a morwe up Lukes day. Now God ous bringe to the blysse that He broght that may! Amen. At Oxford she was born, as I understand. These were her parents, who begot her them between. So well she sped that in six months she knew the Psalter through. All took great joy in her who ever did her know. These days a knight's daughter would scorn of such things think! In the church of Saint Mary, which he had himself begun. Which bears the name now of the maid, who lies enshrined within. To make his daughter a nun; to him it was no shame! And sheared her in the nunnery, with her companions twelve. And planned he would deceive her, by some trick he would devise. It's time you were rewarded for the labour you have done. Honour me, and for your service your reward will be a crown." Another he held out to that maid, if she him honour would. "Away from me, you wicked fiend, with your promises!" She signed the cross, and away he flew with noise and much distress. That at last her father and mother both dead were. He was chosen king at Oxford - a cruel and wicked man. 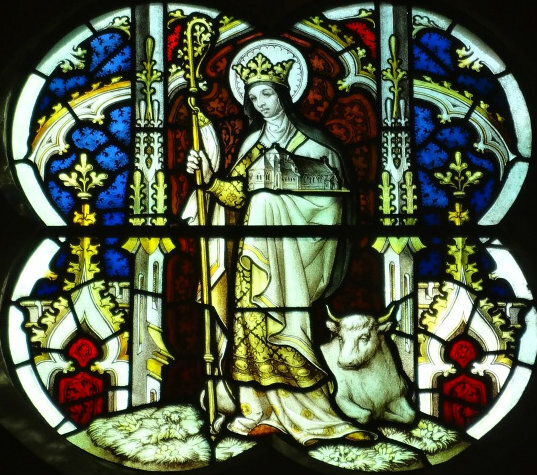 He sent at once for Frideswide, to have her as his wife. She said she was betrothed to God, and would be all her life. If she did, she knew full well God would his vengeance take. And you would be another, if you did his handmaid take." And all at once they lost the power this holy maid to find! So that from there back to the king travel again they might. And from there they went, and told all this to the king. And swore that her witchcraft would no more her save! And bid her flee as best she could the furious king's might. Only a few she took with her - two of them, no more. And therein she found an angel who took them to the land. But dared not go to any town, nor in any house hide. Three winters in a cave she lived, where no one could her see. And as whole as any fish the maid again did stand. And planned to do to the maiden something very bad. And seize this maiden Frideswide by strength, against the right. That she in the wood of Binsey had in secret hid. To seek the holy maid and get her in his hands. After her they all galloped, the king was not the last. The maiden escaped into the town, by God's grace. And fell, and broke the king's neck; and that was all he won! Then none of his men dared within the city come. Glad was anyone who could speak with her or to her go. Throughout all England was no one thought her peer. To a fisherman who, with his friends, in a boat sleeping lay. And when he had killed him, with his teeth he began to chew. And barely, with much labour, they got him tied and bound. That she might cure the man possessed, if she for him prayed. The bound body fell down, as if it were dead. And bid him, in God's name, whole and sound to rise. And the maid who released him from that wicked devil. At her feet the leper fell, and humbly did her greet. She kissed him, and he was cured, just as God willed. And also after her death; they ought not to be hid! May God bring us to the bliss he prepared for that maid! Amen. 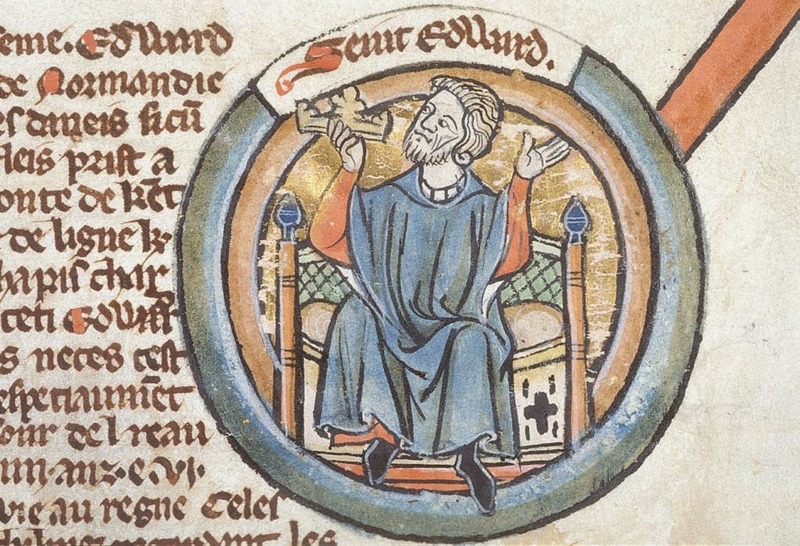 Today is the feast of Edward the Confessor, about whom I've posted many times before, so here's a favourite miracle-story about Edward which - perhaps surprisingly - credits this most problematic of Anglo-Saxon kings with a playful sense of humour. 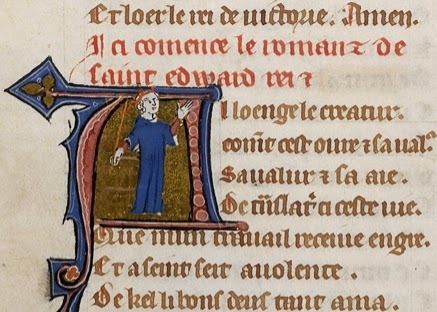 It's recorded by the anonymous author of the eleventh-century Vita Edwardi Regis, the first Life of St Edward. Despite its title this text is only partly about Edward himself; it was written for his wife Eadgyth, daughter of Earl Godwine, and is as much about her father and brothers (much more dynamic and interesting characters than Edward!) as it is about her husband. 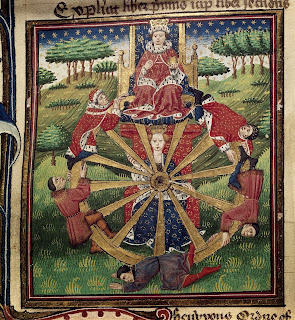 It's worth reading if you ever get the chance: it's the closest thing we'll ever get to the perspective of Queen Eadgyth herself on her extraordinary family. 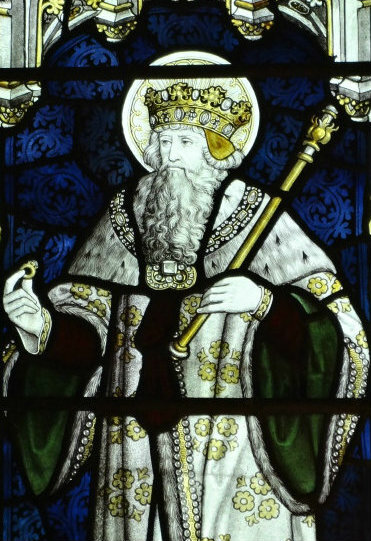 There are character sketches of Harold and Tostig - Harold, patient and wise, 'a second Judas Maccabeus, a true friend of his race and country', but 'rather too generous with oaths (alas! )', Tostig liberal, pious, powerful in his self-restraint, and with 'bold and inflexible constancy of mind', both distinctly handsome and very brave. There's also an intriguing insight into Cnut's relationship with Godwine ('revered by all Englishmen as a father', apparently) and an interesting description of Eadgyth herself. Plus a bit about Edward the Confessor, if you like that sort of thing. The king, therefore, with pious curiosity, came unto him in the chapel, and, calling him to him, inquired whether he could indeed see. This the man began to affirm and gave thanks to God. To test the truth of the words, however, the king, as pure as a dove, stretched forth the palm of his hand, and asked for an account of his action. "You are stretching out your hand, O my lord king," the man replied. Once more the king, sticking his forefinger and middle finger like a pair of horns before the man’s face, asked what he did. And the man answered what he saw. Also, a third time, the king, grasping his beard in his hand, again asked what he did. And the man furnished correctly the information that was sought. Then the king considered that he had been sufficiently examined. The Life of King Edward who rests at Westminster, ed. and trans. Frank Barlow (Oxford, 1992), p.95. Our precise author rather obscures the humour of this story with his dry delivery, but it is, I think, meant to be at least a little amusing. The 'how many fingers am I holding up' method of testing miracles! This is a poem or song from a fifteenth-century manuscript of songs and carols, which includes among many others this carol of the Virgin Mary, and the Annunciation carol 'Tidings true'. Today's poem is on a very conventional theme, the untrustworthiness of the world (for variations of which, see this set of posts), but this is a particularly neat expression of the idea. For thinges that bene untrew. Is ofte faded of hew. No man sett be shame. No man him seilfe will blame. And graunt us a good ende! 10 October is Thomas Traherne Day, in my world. I've posted lots of my favourite sections from Centuries of Meditations before, but I feel like C. S. Lewis did about this book - "I could go on quoting it forever". So today I'll restrict myself to one extract, but also suggest that you go and listen to this reading of another superb passage. Having been at the University, and received there the taste and tincture of another education, I saw that there were things in this world of which I never dreamed; glorious secrets, and glorious persons past imagination. There I saw that Logic, Ethics, Physics, Metaphysics, Geometry, Astronomy, Poesy, Medicine, Grammar, Music, Rhetoric, all kinds of Arts, Trades, and Mechanisms that adorned the world pertained to felicity; at least there I saw those things, which afterwards I knew to pertain unto it: and was delighted in it. There I saw into the nature of the Sea, the Heavens, the Sun, the Moon and Stars, the Elements, Minerals, and Vegetables. All which appeared like the King's Daughter, all glorious within; and those things which my nurses, and parents, should have talked of there were taught unto me. Nevertheless some things were defective too. There was never a tutor that did professly teach Felicity, though that be the mistress of all other sciences. Nor did any of us study these things but as aliena, which we ought to have studied as our enjoyments. We studied to inform our knowledge, but knew not for what end we so studied. And for lack of aiming at a certain end we erred in the manner. Howbeit there we received all those seeds of knowledge that were afterwards improved; and our souls were awakened to a discerning of their faculties, and exercise of their powers. The manner is in everything of greatest concernment. Whatever good thing we do, neither can we please God, unless we do it well: nor can He please us, what ever good He does, unless He do it well. Should He give us the most perfect things in Heaven and Earth to make us happy, and not give them to us in the best of all possible manners, He would but displease us; and it were impossible for Him to make us happy. It is not sufficient therefore for us to study the most excellent things unless we do it in the most excellent of manners. And what that is, it is impossible to find, till we are guided thereunto by the most excellent end, with a desire of which I flagrantly burned. The best of all possible ends is the Glory of God, but happiness was that I thirsted after. And yet I did not err, for the Glory of God is to make us happy. Which can never be done but by giving us most excellent natures and satisfying those natures: by creating all treasures of infinite value, and giving them to us in an infinite manner, to wit, both in the best that to omnipotence was possible. This led me to enquire whether all things were excellent, and of perfect value, and whether they were mine in propriety? It is the Glory of God to give all things to us in the best of all possible manners. To study things therefore under the double notion of interest and treasure, is to study all things in the best of all possible manners. Because in studying so we enquire after God's Glory, and our own happiness. And indeed enter into the way that leadeth to all contentments, joys, and satisfactions, to all praises triumphs and thanksgivings, to all virtues, beauties, adorations and graces, to all dominion, exaltation, wisdom, and glory, to all Holiness, Union, and Communication with God, to all patience, and courage and blessedness, which it is impossible to meet any other way. So that to study objects for ostentation, vain knowledge or curiosity is fruitless impertinence, tho' God Himself and Angels be the object. But to study that which will oblige us to love Him, and feed us with nobility and goodness toward men, that is blessed. And so is it to study that which will lead us to the Temple of Wisdom, and seat us in the Throne of Glory. Many men study the same things which have not the taste of, nor delight in them. And their palates vary according to the ends at which they aim. He that studies polity, men and manners, merely that he may know how to behave himself, and get honour in this world, has not that delight in his studies as he that contemplates these things that he might see the ways of God among them, and walk in communion with Him. The attainments of the one are narrow, the other grows a celestial King of all Kingdoms. Kings minister unto him, temples are his own, thrones are his peculiar treasure. Governments, officers, magistrates and courts of judicature are his delights, in a way ineffable, and a manner inconceivable to the other's imagination. He that knows the secrets of nature with Albertus Magnus, or the motions of the heavens with Galileo, or the cosmography of the moon with Hevelius, or the body of man with Galen, or the nature of diseases with Hippocrates, or the harmonies in melody with Orpheus, or of poesy with Homer, or of Grammar with Lilly, or of whatever else with the greatest artist; he is nothing, if he knows them merely for talk or idle speculation, or transient and external use. But he that knows them for value, and knows them his own shall profit infinitely. I'm posting this Thomas Hardy poem today because it was written on 9th October, 1924. It's always strange to be reminded that Hardy lived into the world of motor-cars and telegraph-wires; for some contemporary colour, you might like to listen to this as you read the poem. It's harvest festival season, and this is my favourite harvest hymn. 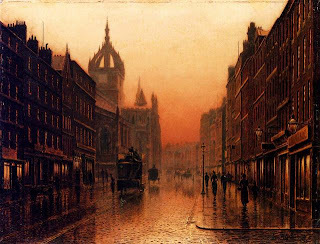 It's by William Chatterton Dix (1837-1898), who also wrote my favourite Epiphany hymn. The reason I like this hymn - and all Dix's hymns, in fact, even 'Alleluia, sing to Jesus' - is that they have a hint of uncertainty amid the joy, an acknowledgement that faith is not easy, even as they then offer comfort for that fact. Pictures of spiritual perfection, even in hymn form, tend to 'make me sick and wicked'; a little doubt can sometimes be more helpful. Here the shadow is over verse 3: 'We bear the burden of the day, / and often toil seems dreary' (dreary with its older stronger meaning), and the hesitation of the petition in the last four lines of that verse. 'May we stand at the last accepted'; amidst all the goldenness and the shouts of exultation, that's a rather tentative wish. I made myself sad the other day, reading In Memoriam and this poem and thinking about fruitlessness. I've just finished my DPhil thesis, which is obviously very exciting for me; it's the greatest fruit my life so far has to offer - greater certainly than the cans of baked beans we used to take to harvest festivals at school. And yet if one is realistic, it isn't much in the scheme of things, compared to the other kinds of fruit one might have borne after 26 years of life. In the eyes of the world, yes, perhaps it's worthwhile, and to me personally, very much so - but to God? I honestly don't know whether or not it's an acceptable first-fruit, as once I thought it might have been. Sometimes I think so; and then I remember how few offerings or prayers of mine have ever proved acceptable to that great silence, and everything starts to seem pointless and futile and all very much like 'my prime of youth is but a frost of cares', as if it would have been better never to have started at life than to fail so hopelessly. I know, I know that's ridiculous (as, indeed, you are probably thinking), because Tichborne was facing execution when he wrote that poem, and I'm just someone who doesn't know what to do with her life and is not really sure that it matters what she does; the situations are hardly comparable. But even so, I can't shake the feeling. Everything feels futile when you have the threat hanging over you that whatever you do might count for nothing in the end (not 'at the last accepted'...). When I submitted my thesis, my friends were very nice about it, but many of them innocently asked the question which stings: 'So, what's next?' Or, as it sounded to my ears: we're bored with this accomplishment already; what else have you got? This is how it's been with every achievement of my life, from the day I learned to read until the day I submitted my DPhil: nothing is ever enough. People always want more from you than you can give, and God, especially, is never satisfied. I think this was the first lesson I ever learned about God, because if you go to a Catholic school and are even a little bit naturally clever you will hear rather a lot about the parable of the talents and how 'from he who has been given much, much will be demanded', and before you are old enough to know exactly what it is you've been given or what you're supposed to do with it, you will have learned that God is never really going to be happy with how you use your 'talents'. And when those talents incline to the scholarly it's all the worse, because as we know, intellectual endeavour is all very well, but it's nothing compared to love (we can all recite this bit by heart, right?) and accomplishments of any kind, however earnestly and diligently pursued and won, don't compensate in the end for not having loved or been loved in the ways that count. I'm good at loving, but not at bearing fruit out of my loves. I've only loved in the ways that don't count, as I remember when I see on facebook my schoolfriends getting engaged and having babies; such fruits of a useful life are better than a tin of harvest festival baked beans too, and there's no question that those fruits are acceptable to God. That makes it sound like I'm just jealous of them, and I am, bitterly, heart-wrenchingly jealous, but it isn't only that - we all have to bear some kind of fruit in our lives, and it's much harder to do that if you're not good at making people love you. I've never been good at making people like me. I have qualities which in some people are found lovable, but in me simply are not, for reasons I don't entirely understand; and however much you may love, if you are not lovable then your love doesn't bear fruit. If you produce something - a novel, or a thesis, or a blog - without having that magic quality that makes people feel they can like and trust and connect with you as they read it, how can it bear fruit? I don't have that quality, and I'm not sure it's something one can learn. Everything I've ever written, everything I've ever seriously done or attempted, has been born of love, and I've tried to serve the things and people I love honestly and faithfully and well; but because I'm not lovable my love stops with me, and is fruitless, and not enough. So I wish I was good at something useful or valuable, as my friends are good at making others love them - as other people are good at making their lives worthwhile. I wish I had anything to offer or anything to say that people wanted to hear. And most of all I wish I knew what I ought to do with my stupid life, and that it mattered to anyone either way. I don't know why I write posts like this; I'm always ashamed of them after I hit 'publish'. They're silly, and don't do any good. But I can't tell anyone in real life - and what else is the internet for but narcissism? In any case I suppose harvest is the right time to think about these things; and Dix's hymn helps a bit, though I don't know why. Today is the 120th anniversary of the death of Alfred Tennyson, and this is the section of In Memoriam which that fact made me think of.